Here is something else I love when it comes to candles – a clever name. Whiskey in the Pines… very cool name! Smelling the wax, I definitely smelled the outdoors and fresh pine mingled with vanilla maybe? Let’s find out! I was right!! Pine and vanilla. Don’t you just love it when that happens? ? The sandalwood and amber? Oh I hope so! That mix sounds divine! Let’s find out! Finding the right room is always key when burning a candle. In this case, a small room gave the perfect strength for my 8oz Whiskey in the Pines. In fact, I probably could have easily moved it to a medium size room and it would have performed just as well. The strength from this little candle was awesome. Once the wick was lit, it took a good half hour to reach a full melt pool and the aroma…. the fresh scent of pine and creamy vanilla filled my guest bathroom. The amber and sandalwood I’m afraid didn’t manifest for me but it was a little hard to tell. The pine really dominated this fragrance more than anything else. All I could smell was pine blended with sweet vanilla. Strength – I would rate this candle a 10 out of 10 in a small room. 7/8 in a medium which isn’t bad for this size candle. Whiskey in the Pines – still loving the name, and I liked it, but I think I would have loved it a whole lot more had there been a bit more sandalwood and amber in the mix. That’s just me. What I could smell was still delightful. A perfect blend of pine and creamy vanilla. Two of my favorite scents. 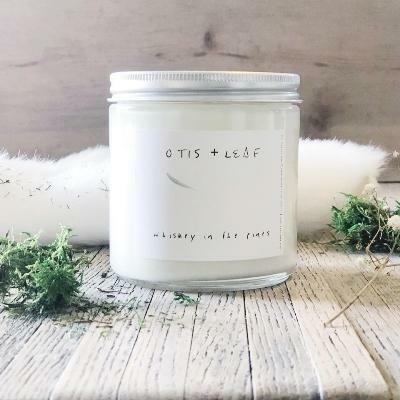 I have two more fragrances to try from Otis & Leaf coming up. Vanilla Irish Cream and Fig Bellini. Yum! !